Think of them as projects. If you’re an expert in business promotions, for example, you probably have multiple projects going on simultaneously that consist of materials you might need to order for your client (like special paper) and the actual work you do (design, content creation, etc.). 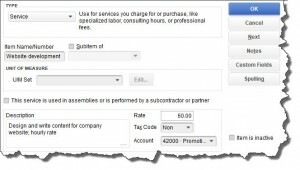 You could also have to track expenses like mileage, and you may price your services by the hour. Before you create your first job, spend time envisioning how you want it structured. Remember that every invoice or timed activity or other income or expense you enter will only be assigned to one Customer: Job, but you can include as many Items as you want. As we said, we’re happy to help you think this through and go through the setup with you. If you’re going to approach QuickBooks’ jobs tools, be sure to carefully consider how your work should be structured. We can help. Do you need to track income and expenses for a specific set of tasks or products? QuickBooks’ jobs feature can help you do so.